Sagault has been practicing writing since he has been able to write and theatre for the last thirty years. He created in 1983 the first fully improvised one-man-show, Les Mille et une Nuits du Tarot, ou le jeu du hasard, performed more than 100 times in Paris and all around France. One of his short plays, Far finta, was created in La Ferme-Théâtre à Besançon on august 2001 by André Mairal. From 1982 to 1988, he created and animated for the C.N.E.D. (Centre National d’Enseignement à Distance) the adults formation « Théâtre et expression de soi ». improvisation, together with parléjades and veillées in which he associates storytelling, improvisation and reading aloud. gave rise to a show and an exhibition ; in 1997 La Vallée, his first « livre-sujet », which evokes the Valley of Ubaye ; and in july 2000 Quelques nouvelles d’à côté, Éditions Gros Textes. Written for children of every age and illustrated by Jutta Ash, La marmotte qui ne voulait pas siffler and Jamais ! disait l’aigle have been published by the Éditions de l’Envol in 2001 et 2002, and brought to the stage by Martine Frénay, storyteller and plastician. Sagault has presented their little brother, Le gros petit loup, at the Salon du Livre in Paris on march 2007. He has completed Des nouvelles d’à côté, two collections of Légendes des Tarots, and prepares Les Tarots de Venise while pursuing the writing of the Dictionnaire d’un homme moyen (Dictionary of a common man), his third « livre-sujet », of which the first publishing, a few head-shaped copies, has been exhibited in october 2000 and 2003 at the Fête du Livre d’artiste de Forcalquier and presented in may 2001 at the Bibliothèque municipale de Digne, before being welcomed in october at Belfort, in january 2002 at Venice and at the Conseil Général des Alpes de Haute-Provence for L’art de mai 2002. Following his ancestors Jules Breton and Albert Carrier-Belleuse, he has been attempting, since 1991, to give shape, through paintings and engravings, at what he sees when he shuts his eyes. He works presently to the Livre des nuages, second section of a written, drawn, engraved and painted tetralogy, which began with Le Livre du caillou and will go on with Le Livre du vent and Le Livre des visages. Within the context of Le printemps des poètes 2004, he has presented the exhibition PEINDRÉCRIRE at the IUFM of Digne, together with two publications of the Éditions Gros Textes, Si peu de chose, a collection of his poems, and Chronironiques, a collection of his chronicles. 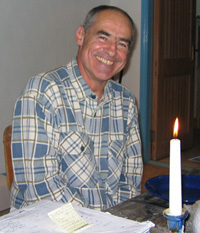 Written with his friend Jean Klépal from the mails they have been exchanging in 2005 and 2006, À hue et à dia has been published by Gros Textes in november 2006. After the retrospective exhibition ITINERAIRE D’UN HOMME MOYEN at the Musée de la Vallée of Barcelonnette. Sagault has been invited twice by the Cill Rialaig Project, to a residency in september 2003 at the Cill Rialaig Artists Retreat, Co Kerry, Ireland and to return there in february 2005 to prepare his project A RIDE ON THE WILD SIDE, associating painting, writing and storytelling. 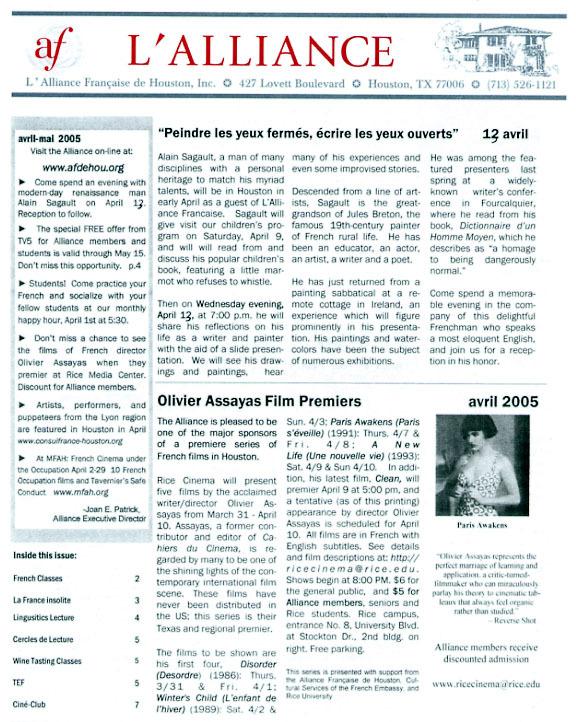 A first presentation has been given in Houston in april 2005 at the Alliance Française invitation. The complete performance has been presented in may 2006 at the Alliances françaises in Cork and Dublin. On this occasion, he has given the first public reading of some of his Cill Rialaig Tales. His watercolours have been presented at the Galerie du Moustoir, 156, 29170 Saint-Evarzec, during the summer 2007. A RIDE ON THE WILD SIDE was presented during may 2008 at the Librairie IMAGINEZ (Barcelonnette), and the exhibition was ponctuated by 5 interventions on the ongoing works of the artist : The Cill Rialaig Tales, Les Tarots de Venise, Le Dictionnaire d’un homme moyen, his chidren (and adults) tales and his publications with the éditions Gros Textes. Together with Jean Klépal, Sagault has published by Gros Textes in march 2010 RIEN, a collection of texts printed face to face, and Presque rien, an art book in which 18 of his watercolours are confronted to some short extracts from RIEN. Among the « Ritournelles de la durée », new exhibitions of the Musée-Muséum départemental de Gap, 2011), Alain Sagault has presented from november 19th 2010 to april 30th 2011 the exhibition L’HOMME MOYEN, RÉSIDENCES PEINTURES, ÉCRITURES, giving on february 5th and 6th a workshop in writing and creation, « Chacun son dictionnaire ». He has completed his fifth résidence at the Musée de Gap in july and has given on july 28th at the château de Montmaur a workshop, « Watercolour, in search of the essence of Landscape ». The Museum of Gap has acquired two of his « livres-sujets » and the watercolour « The Skelligs from Saint Finian’s Bay », at present in loan at the Chambre de Commerce et d’Industrie des Hautes-Alpes. QUASI NIENTE, il percorso dell’uomo qualunque : from april 20th to may 1st 2012, invited by the agriturismo Il Morsetto, Vigna Monte d’Oro situated at Verzuolo, near Saluzzo, Piemonte, and within the annual manifestation of contemporary art « Saluzzo Arte », Alain Sagault has exhibited the progress of the common man paintings and writings, especially as regards his attempts to produce through minimalism the essence of the elements at work in what we call "landscape". On this occasion took place the first presentation of the fourth book issued from the complicity between Jean Klépal and Alain Sagault, « Regarder la peinture ». To see all the photos, click here : "Regarder la peinture" in "Le globe de l’homme moyen". In may 2012, Sagault’s artist books, including his "livres-sujets", have been exhibited at the Médiathèque de Barcelonnette in the exhibition Livres et Formes. From june 4th to august 31th, for the Art de Mai 2012 alongside with the stupendous [exhibition of Benoît de Souza, L’homme s’en vA de l’homme->http://www.archives04.fr/jlbweb/Archives%2004/Portail%2015.htm], the Dictionary of a common man was exhibited at the Archives départementales des Alpes de Haute-Provence, who acquired it in 2001. "La marmotte qui ne voulait pas siffler", the first of my tales for every children, has just been republished by the remarkable Éditions PAROLE, inaugurating their new collection "Pourquoi ?" I have given two summer ateliers d’aquarelle for the Musée-Muséum de Gap au château de Montmaur. The exhibition « QUASI NIENTE, i colori della luce » has been presented from january 16th to february 7th by L’Alliance Française de Venise at the superb Casino Venier, famous "ridotto" from the 18th century. can be seen at the "Hôtel de la Plage", F-62179 Wissant. Dans le cadre de "L’été de la peinture" organisé par l’association Art et Histoire de Wissant du 21 au 28 juillet, Jean Klépal et Alain Sagault ont participé à deux rencontres le 23 juillet et le 26 juillet à 15 h. La première s’intitulait : Presque rien, mais encore ? et la seconde : La peinture a-t-elle encore un sens ? More on this exhibition and its motivations by clicking on its title above. On december 14th, Jean Klépal and Alain Sagault animated at the Musée-Muséum de Gap a meeting : "Lecture d’œuvres : rencontre et analyse d’une peinture".